A Boston cop with deep Dot roots notched his second pro boxing victory on Sunday night in front of a Gillette Stadium crowd. Billy Traft, a 33-year-old who was born-and-raised in Adams Corner, stunned opponent Dan Bonnell with a knockout after just one round. Traft, who cut his teeth in the kids’ boxing program at the McKeon Post, is a two-time Golden Gloves New England champ (’05-’06). After focusing on his career as a police officer for the last decade, Traft decided to finally try his hand as a pro last May. “When I became a police officer, I never thought I’d go pro,” but this year I said, ‘If I don’t do it now, I never will. I definitely have the bug again now,” Traft told the Reporter. 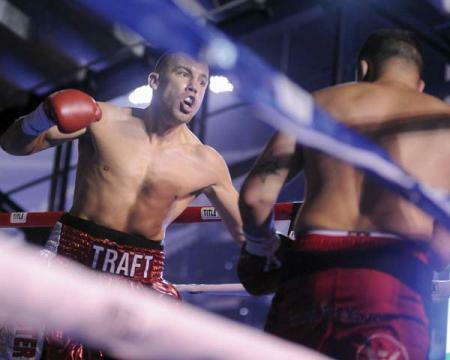 Traft trains daily at TNT Boxing in Braintree, where he’s coached by Marty McDonough. He puts in a couple of hours of gym time after his day shift on the BPD’s Gang Unit— an assignment that also helps him stay in shape. “The days go by very quick,” Traft says of the squad, which he’s been assigned to for the last five years. Traft said he knew quickly on Sunday night that he’d have the upper hand in his bout with Bonnell. “As soon as a hit him with the first jab, I could tell I was stronger. The thing I noticed about the pro ranks, you can see the punches take a toll, because of the smaller gloves and no head gear,” Traft said. At Traft’s side as he entered the Gillette Stadium ring were his two brothers Matt and Bobby Traft, along with two fellow boxers who are also Boston cops: Tony LaMonica and Matty Ryan. Next up for the Dot pugilist?